the hosting server went down last night around 1am and didn't come back up until 10am this morning, and even then, the database would still intermittently go offline. i slept restlessly, waking up every other hour to check and see if i was back in business. once again, i didn't get a good night's rest. i ate the rest of last night's burrito for lunch, warmed it up in the toaster oven, crispy on the outside, cold on the inside, just the way i don't like it. along with that delicious leftover i made a smoothie, everything but the kitchen sink, including a squeeze of lemon juice for good luck. i took care of some outstanding errands: paid some bills (mortgage, life insurance, utilities, cellphone), stored the bikes back in the basement, hosed down the barbecue grill, did some weeding, washed the dishes, made some ice cubes (with lime slices), watered the plants, relocated the lawn gnome, cleaned up the house a little bit, and cooked up a bag of edumame beans. i almost took a nap, but got a call from my mother telling me she was coming over for dinner. i kept myself awake for her arrival, we had some food she had brought back from new york city last night. my mother didn't even realize i had shaved off a part of my goatee, but when i told her what i'd done, she said i should've shaved the moustache off as well. andrew came home right while my mother was cleaning my kitchen and chastising me for leaving it so dirty. she left soon afterwards, no dirty dishes in the sink, all the clean dishes back in the cupboards, leaving the leftovers for andrew to have for dinner. later in the evening, i got an instant message from bruce (back from the adirondacks), about going over to his place to see the two monarch caterpillars he found during his vacation. i went over and was greeted at the door by bruce in his underwear. he looked at me for a minute, assessing my new ironic moustache look. 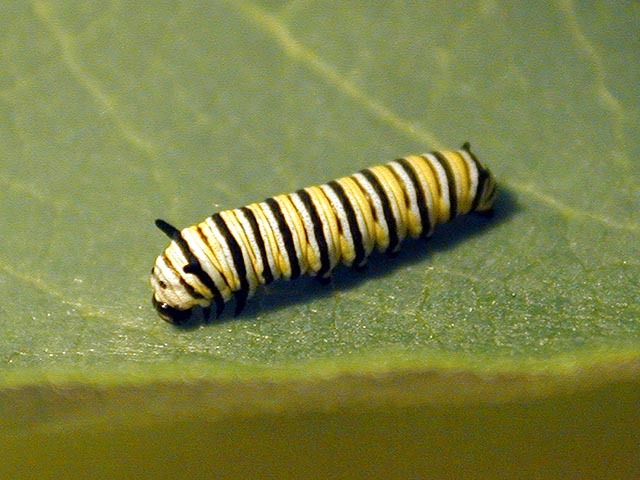 we went to the kitchen where he had two jars, each one containing a milkweed leaf and a caterpillar. although i've seen monarch butterflies before, this was my first time seeing live monarch caterpillars. 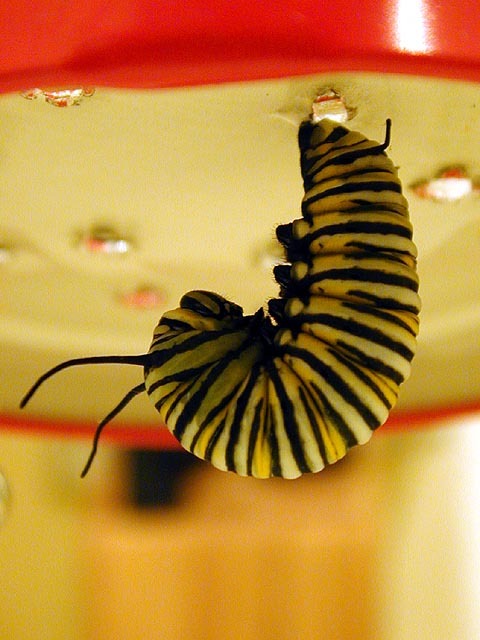 in one jar, there was an old caterpillar already securing itself to the lid, about to form its chrysalis. at the bottom of the jar were black pellets submerged in water, caterpillar poop. in another jar, a baby caterpillar, many days away from its chrysalis stage. i think the coolest thing about monarch butterflies isn't their color (bands of yellow, black, and white) but rather their extra long antennas. the past few nights i've slept no more than 5 hours. this unnecessary sleep deprivation is taking a toll on my strength. i'm going to hit the bed early tonight, wake up revitalized tomorrow morning so i can go running.